In the early 1930s Olaf Bloch was the president of the RPS. He was also chief chemist of Ilford's laboratory, and I was already aware of a paper he presented early in 1933 to the Royal Society of Arts called Recent Developments in Infra-red Photography. During that presentation he took an infrared photograph of the audience which was projected later. The RSA journal does not include the photograph. I recently got hold of a copy of the RPS Photographic Journal for August 1932, knowing it included an article on infrared. I had hoped that, given the date, it would give me some more information on the infrared plates that became available during 1932 from Kodak and Ilford. That wasn't the case. Instead the RPS paper was an earlier appearance of Bloch's presentation, actually given in April 1932 and hence a little early for my historic purpose. 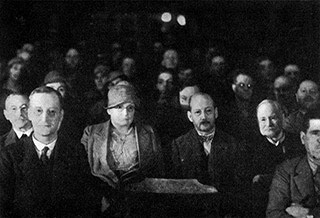 However, despite this lecture being given unexpectedly because the planned showing of various new pieces of equipment wasn't possible, Bloch performed his 'party piece' with an infrared photograph of the audience. This is it. I don't think this was taken in complete darkness but I would expect the normal room illumination was low and lamps with infrared filters were set up for the purpose. The published paper also included a long-distance infrared photo of the Isle of Arran that was published in the Times on May 30th 1932.